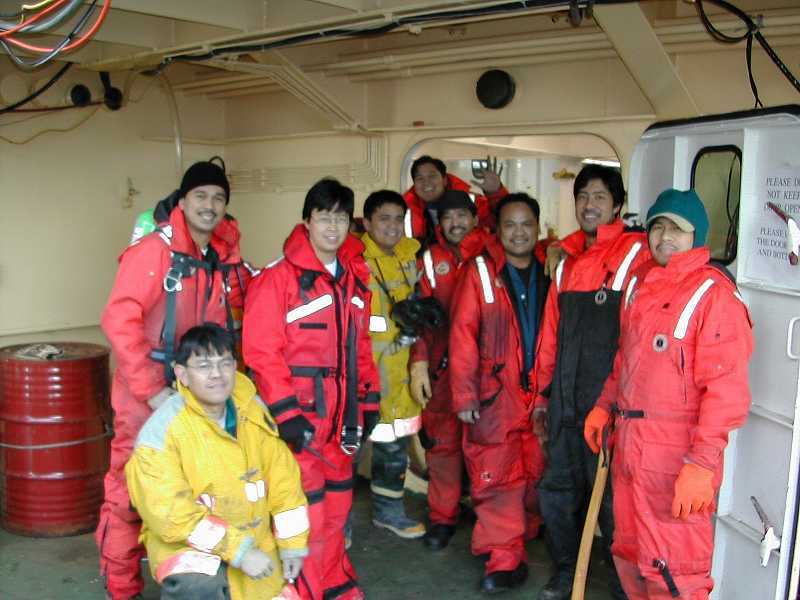 The ship's Safety Crew on the Nathaniel B. Palmer pauses for a photo after responding to and completing one of the weekly fire drills aboard the N.B. Palmer. Left to right: (kneeling) Bienvenido Aaron; Ronnie Carpio; 3rd Mate, Rachelle Pagtalunan; Danilo Plaza; Ricky Tamayo; Fredor Dela Cruz; Rogelio Pagdanganan; Lorenzo Sandoval; and Lauro Garde (Photo by Peter Wiebe).